In a blast from the past kind of situation I had a para-professional return to working in my classroom this week after a few years (four? five?) of focusing on a different career and working as a para in others classrooms/programs. We have moved classrooms (and buildings) since we last worked together and today she was walking around the room looking at all of the different things I have hanging on the walls. She caught my eye and said, "I'm looking for that poem you used to have hanging up. You know, the one about the kids who are different? I love that poem. I took it down and photocopied it when I worked here and I give it to people who would be moved by it." I am posting the poem below for all of you. It's their difference that makes them unique! Need money (for your class)? I was on Ebay and I saw this IR remote control for Windows Media Center. I immediately thought of how we could use it in the classroom, via the IR settings on AAC devices. It cost me twenty dollars and today I installed the software (which was way more complicated than it needed to be, but I am guessing that some of the name brand IR remotes for Windows would not be as bad). It works great, I started programming it to control Windows Media Player via the Dynavox. As you know from previous post programming the Dynavox to send IR commands is amazingly simple. Now instead of detaching the Dynavox from the wheelchair and using switches to control Windows Media Player my student can just use her device. P.S. I know that the Dynvox can control a computer via the Access IT accessory, but we don't have the Access IT accessory. Looking for a unique item to switch adapt or the perfect age appropriate item for a visually impaired user or simply one that is motivated the sounds? My favorite catalog for a long time for this type of item is Speak to Me. Not only do they have great "adaptables", but also recordables for innovative VOCAs and inexpensive talking clocks/watches, calendars, calculators and more. Remember that anything that is IR or x10 remote controlled can be run with most high tech AAC devices (Dynavox, PRC, etc) and ECUs. I have often found ESL/ELL materials to very helpful in my classroom. They are often a wonderful source for low level yet age appropriate images, worksheets and activities. Here are links to two pages that offer free symbol-based flashcards. I like that for some of my students this is a nice way to expand there knowledge of pictures beyond Boardmaker images. There are also great lesson plans and such on these websites. I work in a school that does not have internet access, except sporadically in a non-accessible computer lab. I know that this is a rarity for our part of the USA, but there must be others out there in our situation. I have an excellent work around for when I want my students to access online content. Here are some instruction on how to do it (for free). 1. If you do not already use the Firefox Internet Browser from Mozilla you will need to switch, at least for this, but it is such an excellent browser I am guessing you will want to switch for everything. 2. Install ScrapBook for Firefox. You can do this by going to the ScrapBook Site and download (you will need to add ScrapBook to the list of allowed sites when asked to). Or you can go to the file bar and go to Tools, then choose Add Ons, then in the lower right corner click Get Extensions. This will open a new web page, in the top middle there is a search bar type in ScrapBook. From the results choose ScrapBook by Gomita. Download, install, restart Firefox (don't worry all of your other open tabs will restart automatically). 3. Go to a website you wish to access off line. For example a favorite story in the The International Children's Digital Library. Choose a page to experiment with and go to your tool bar and choose ScrapBook. Now you have a few choices. The first capture option will allow you to access that page off line. 4. There are much more advanced option for using ScrapBook. For example you can capture and entire Tumblebook or other .swf such as Pass the Ball. In an attempt to not recreate the wheel I will point you to some excellent tutorials to learn how to do these things. First there is the ScrapBook Website and second the printable PDF of the ScrapBook tutorial. A couple of days ago Ja Medlicott of The North Carolina Assistive Technology Program emailed me and offered his Power Point Scan & Talk resources to share on this blog. I have posted his slide shows on Slideshare and also put them into the TLWMSN Google Groups files. 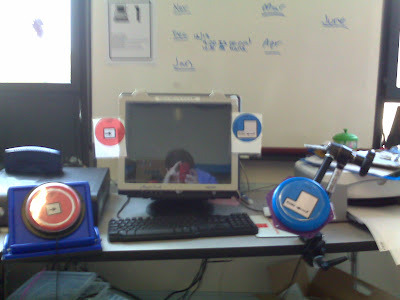 Enjoy this innovative way to offer basic scanning AAC with software you probably already have. Buxton Center is offering a $12.00 Speaking Dynamically Pro Board Set that accesses the free program Win Amp to play music files. This board and scripts allow Win Amp to MP3s without opening a music application over your SDP boards. However, that has not always been the case. Earlier in my career I was placed in situations where either a student would not be able to get AAC or I needed to do the leg work (get rentals, arrange and collect data, create the funding applications and write the supporting letters - with an SLP signing them). With that in mind I offer other intensive special needs teachers out there a link to a great new website, AAC Funding Help. The name pretty much explains it all. The site includes information, FAQs a report coach and more. Come on teachers and especially other bloggers! Get involved with Donors Choose! Take the Special Needs Stakeholders Challenge! I just had THREE $500.00 grants funded for my classroom in the past two weeks. One of math materials including Touch Money and Edmark Time Telling. The second of physical science lab materials. The third is of sensory intergration materials. That last grant is amazing because Donors Choose offers catalogs to choose from like Abilitations which have sensory, AT and AAC items in them. I have three more grants up now. One for a DVD Camera to make portfolios, one for vocational training materials and one for writing adaptations and Handwriting without Tears. Donors Choose is our chance to support a charity that supports us! Bloggers post the Special Needs Stakeholders Challenge Thermometer on your blog. Let's raise some dough! Help Kidz Learn is a new (FREE!) website by Inclusive Technology of the UK. Some of the content is created by Ian Bean who creates much of the content on the popular (FREE!) Priory Woods site. There are four types of activities: games, stories, creative and find out. Plus there is a parents section that explains switch use. The activities are all switch accessible, however the top site does not explain that once inside most activities you should press "Escape" to access the options menu and choose access method and set things like prompts, number of switches and scan rate. Right now there are also 25 "Advent" activities relating to Christmas available. This is what Inclusive Technologies has to say about their new site, "We are launching a new, free, vibrant website for children with special needs and their parents - www.helpkidzlearn.com. Help Kidz Learn will have free, fun educational games to play online and lots of creative activities for children. It is supported by helpful information and advice written by qualified teachers." You may also want to visit the Inclusive Technology Downloads Page. I am moving one of my students (who has a progressive condition) from direct select with a touch screen/key guard to two switch scanning. Two switch scanning is also called dual switch scanning or scan and select. It means using one switch to move the selection from one item to another and another switch to make a choice. In this case the left, red switch is used to move the arrow/cursor and the right, blue switch is used to enter the final choice. For now the student is using only two different programs for learning this new skill, Stages Levels Five and Six and Boardmaker with Speaking Dynamically Pro with a customized set of boards. The learners speed and accuracy are improving gradually. Above is a picture of our set up, although the switch easel on the left has been replaced with another universal switch mount. This student is my first to use two switch scanning, although I have had dozens of single switch scanners. In this case I have chosen two switch scanning to reduce cognitive load and because the students physical limitations do not allow timing of switch hits. Below are resources I have found helpful in our transition to two switches. Information to help you write those IEPS. "Free-Reading is an ongoing, collaborative, teacher-based, curriculum-sharing project. We're looking to provide a reliable forum where teachers can openly and freely share their successful and effective methods for teaching reading in grades K-1." This is a project my class does every year around the fifth of November. We draw a large turkey shape (about the shape of a bread board) and use our switch activated battery scissors to cut out lots of feathers. Then we write out what we are grateful for on the feathers and post them all through the next couple of weeks. 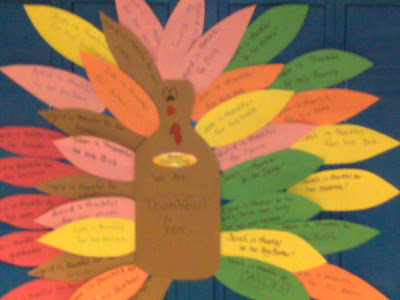 The turkeys plumage gets larger and larger as we find more things to be grateful for. Students use many different means of communication to tell us what to write on their feathers - Dynavoxs and other high tech AAC, picture symbols, speech, sign language, word approximations and yes/no questions and answers. This is another project we do every year. 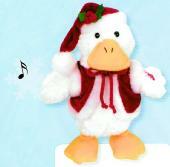 We trace out hands and then glue feathers to the fingers and a beak and waddle on the thumb. We also glue on feet and draw an eye. We use our switch scissors for the cutting and our devices to choose the colors or feathers. 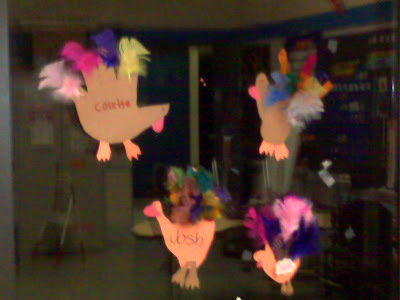 You may also be able to see the remnants of our Les Mis unit because one students named his turkey, "Cosette"! Participate in the Special Education Stakeholders Challenge! Calling all special education stake holders, especially other special needs and disability bloggers. I am creating a challenge. Donors Choose is "a simple way to provide students in need with resources that our public schools often lack. At this not-for-profit web site, teachers submit project proposals for materials or experiences their students need to learn. These ideas become classroom reality when concerned individuals, whom we call Citizen Philanthropists, choose projects to fund." While doing a bit of research today on interventions for decreasing sensory related behaviors I ran across a post on PMLD Scotland (a message board for intensive special needs teachers in Scotland) that mentioned Sensitive Stories. A few clicks later and I was learning about this exciting technique for teaching adaptive behavior skills to learners with significant or complex special needs. Sensitive Stories are to learners with severe, multiple disabilities what Social Stories are to those with Autism. They present difficult topics in a structured, multi-sensory story telling format. They are based on the work of Chris Fuller who started Bag Books. Bag Books are tactile books taken to the next level. They include not only a story text and textures, but also related objects and, often times, scents. For example a story about a camping trip includes "camp fire aroma / tape of camp fire song / tent flap, Velcro / tin mug, toothbrush /quilted material with zip / plastic frog /torch (flashlight) / metal spoon, frying pan / plastic ‘spaghetti’". There are about 25 titles, including selections for children, teens and adults. (I want the entire teen library for my class!) The stories run about 55 pounds (a little over $110 US) each. Int he UK some libraries carry some or all of the Bag Books. 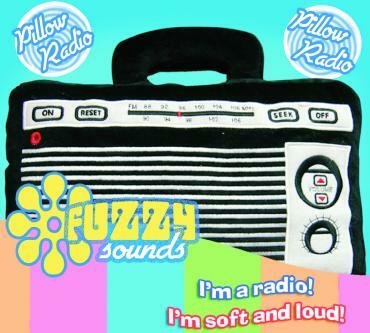 Multi-Sensory Stories are a take off on the Bag Books concept. The University of Dundee and PAMIS (a Scottish charity for those with intensive special needs) created 50 Multi-Sensory stories that are similar in content to the Bag Book Stories. From there researchers at PAMIS decided to create Sensitive Stories, Multi-Sensory Stories that address significant issues in the lives of those with complex special needs. They employ the concept of a multi-sensory story with the interventional design of the social story. Topics include sexuality, menstruation, epilepsy, toileting, respite, going to the dentist, transition and more. I see no reason why special needs teachers outside of Scotland (where the pre-made stories can be taken out of the PAMIS library) cannot create these types of Sensitive Stories for their students. TLWMSN placed seventh in the Best Education Blog category at the 2007 Weblog Awards. We were within ten votes of the sixth and fifth place finihers. That is excellent, especially since my desire was only to have a special education blog nominated. Thank you to everyone who voted! A new Ablenet Magic Arm switch mount arrived in my classroom today to replace the second gooseneck switch mount (by Enabling Devices) to break in six months (I am never ordering another one of those again). The Ablenet Magic Arm came in three pieces, the clamp, the arm and the plate. That got me thinking, perhaps it is cheaper to buy the pieces and assemble the mount yourself? So I did some research and long story short it is cheaper. The clamp is called Bogen - Manfrotto Super Clamp and runs $30-40. There are many plates you can attach to Velcro or screw the switch to they include the Bogen hexagonal mounting plate and the Bogen rapid change mounting plate these range from $18.00-50.00. Your best bet might be the ones made specifically for switches sold by Ablenet for $19.00. You can even buy the clamp and arm together for $116.00 from Amazon.com. This buying the arm and clamp from a non-special needs vendor and the plate from Ablenet maxes you out at about $136.00-160.00 versus $210.00 for the Ablenet Mount, $219.00 for the JR Cooper Mount or for the mount. That is a savings of about sixty or so dollars. Want to spend that sixty bucks? Look around at some of the Bogen - Manfrotto accessories for the magic arms like for the cord clamp for about $4.00 and the mount base (replaces the clamp) about $30.00. Want another cool mounting option? This runs $20-55 depending on the size you choose. I haven't tried it yet but this is the Joby Gorillapod (and I want one). It is a flexible tripod mount for cameras, but add a switch plate from Ablenet (see above) or even the $5 flash clip and you can use it to mount a switch or what ever you want. The legs can wrap around things like wheelchair arms and stander parts to position your switch. Tonight I taught the first half of a workshop on Boardmaker 6.0. It was a small group, but the biggest hits of the evening were the three following new Boardmaker 6.0 features. Shuffle - the participants in the class loved the new feature that allows you to select three or more buttons and have them randomly swap places. Perfect for making Bingo/Lotto boards and randomizing those multiple choice questions. More here. Enlarging a button while keeping the symbol and text proportional. I don't know how many people know about this, but if you hold down control (shift on a Mac) the image, text and button change size proportionally. You can even shrink or enlarge multiple buttons proportionally. More here. Drag and Drop Multimedia - former 5.0 and earlier users really loved being able to drag pictures from internet browsers and other applications right onto a board. They particularly liked being able to pull images off of favorite educational websites like Starfall, Learning Pages, DK Images and others. (On the same wavelength they liked being able to import images into the symbol finder regardless of image format.) More here. On Thursday we'll review all the features we've covered, talk about templates and learn to use the symbolate feature and a few more things, plus lab time to create. Links to the PDF Tutorial Files above come from the Mayer-Johnson Sharing Site. TLWMSN will be on a short hiatus while my computer is repaired. I was repairing a virus and deleted a root file (very bad). The computer is currently at CompuUSA getting a full data backup so I can reinstall Windows. Unfortuantely my current school does not have internet and blogging from my Blackberry is something I do not want to do. So cruise through old posts while you wait for some new ones to appear. I expect to be back online by Wednesday. Thank you to those of you who either nominated me or seconded the nomination for TLWMSN in The 2007 Weblog Awards. TLWMSN has been named a finalist! That means out of all the nominations in the category of "Best Education Blog" TLWMSN was recognized in the top ten! The polls to vote are not open yet, but I hope when they are you will all mark your electronic ballots for TLWMSN.